With smart phone are now powered with dual core and quad core processors, they are faster enough in speed and hardware to perform high end computing like as you do on your desktop and laptop. With the capabilities of phone camera now you can easily record 720p and 1080p full HD video recording and smart phone have emerged so good that these bulky videos can be directly edited on your smart phone as well. We did go through Ultimate Special FX Android application which will add ultimate special action effects on your movie and AndroMedia Video Editor is another nicely designed Android application working as a video editor right on your phone itself. This allows users to design simple videos with easy to understand interface so that users will not have a hard time running for the tutorials. AndroMedia is best suited for creating short clips. Within matter of minutes you can fully create featured videos and design them in minutes with minimum transition effects. The users have control on various configurable properties like frame size, transition effects, output format and the quality. 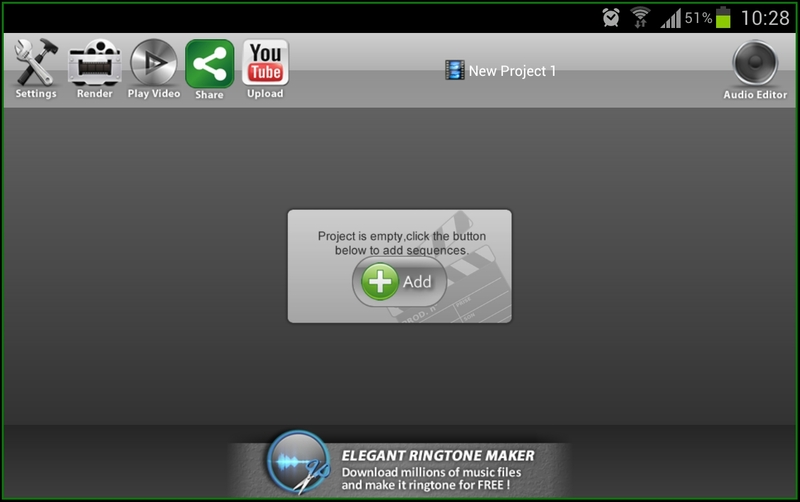 Open AndroMedia Player and tap on Create New Project. 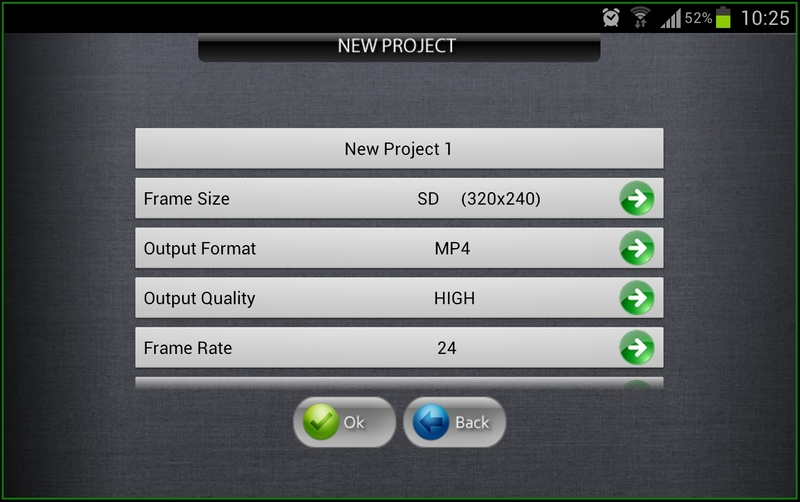 You need to provide some basic standards like frame size, output format, output quality, frame rate, default transition and when you have done those you can tap on OK to proceed to the next level. 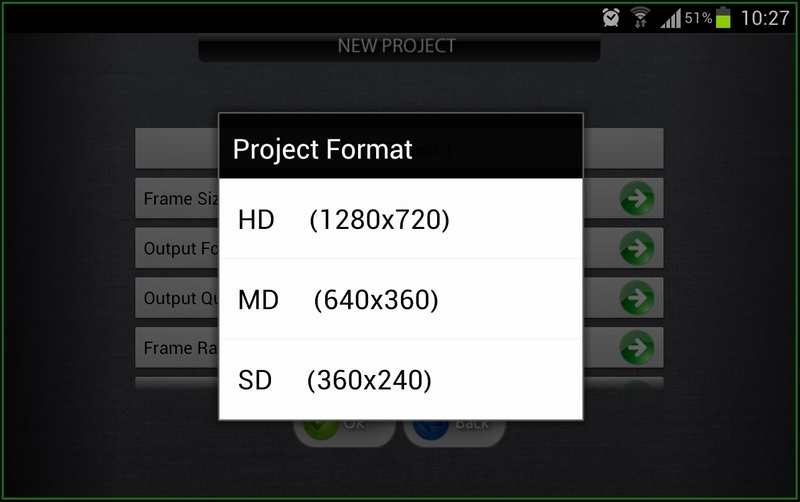 Frame size can be select in the range of 1280 x 720, 640 x 360 and 360 x 240. 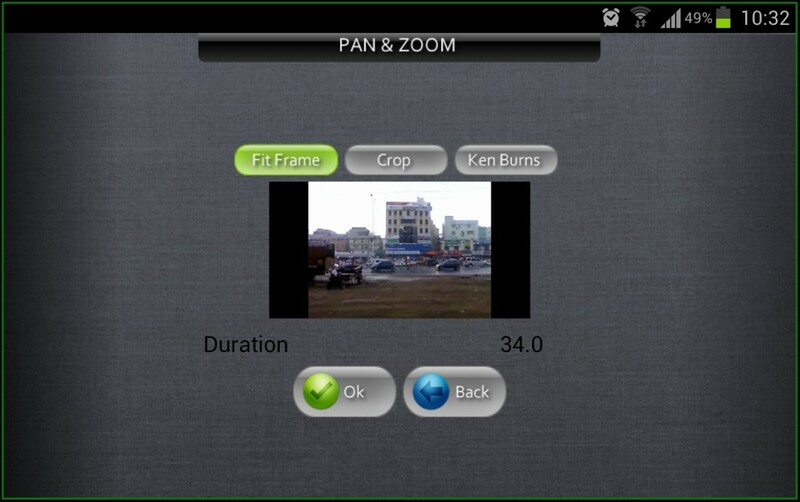 Output format can be of Mp4, MOV, 3GP. This is how your project editor will look like without any addition of video files or image files. To add a video tap on ‘Add’ and browse through the location where you have saved your video file. You can single video or multiple videos as well. Alongside with videos you can also add images as well. As you seen in the video editor tool here is on the top left hand side we have settings, render, play video, share and upload options and on the right side top we have the audio editor settings. Once you are done with your video you need to render it first and then play it. In between two videos or the image files that you have selected, you can add various types of transition settings like cross fade, slide left, fall, shrink or fill. Once you are done with the video editing, you need to tap on render. It will take up to 3 to 5 minutes for your video to render the complete project and this is dependent on the video file size. So if your video is HD video then it will certainly take good time to complete rendering. The rendering also depends on the processor and the RAM configuration of your phone. While when the project is been rendered, you shouldn’t minimize or switch to another application. 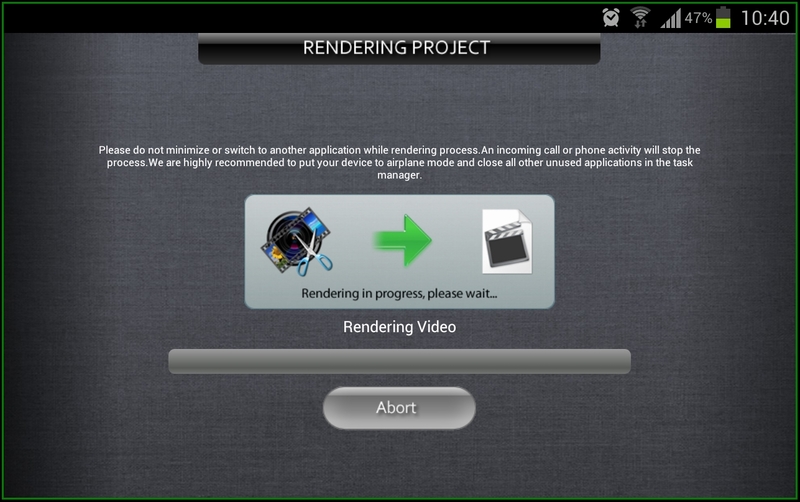 Also the incoming call or phone will automatically stop the process of rendering. The developers of this application suggests to put the device in airplane mode and close other application running for faster and better rendering of the video. 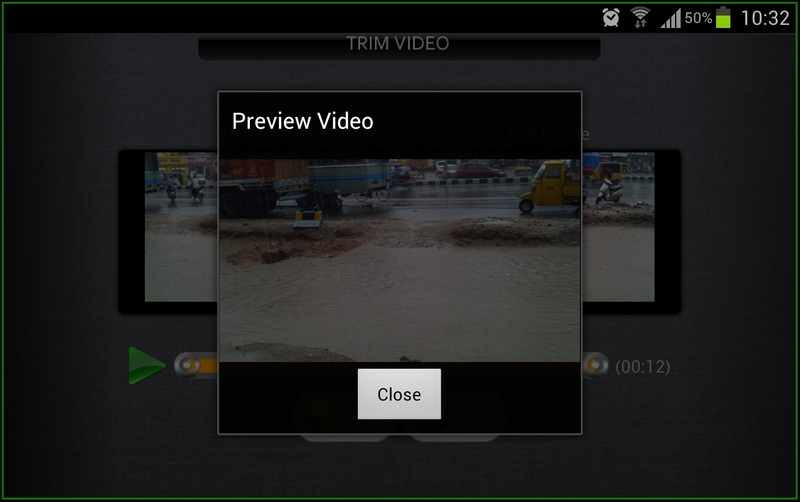 Users can abort rendering by tapping on the Abort option. When the rendering is done, you would see the file path, file name and duration along with length in the information. There you have the option to directly upload to Youtube and on the left pan side you can play your video directly. 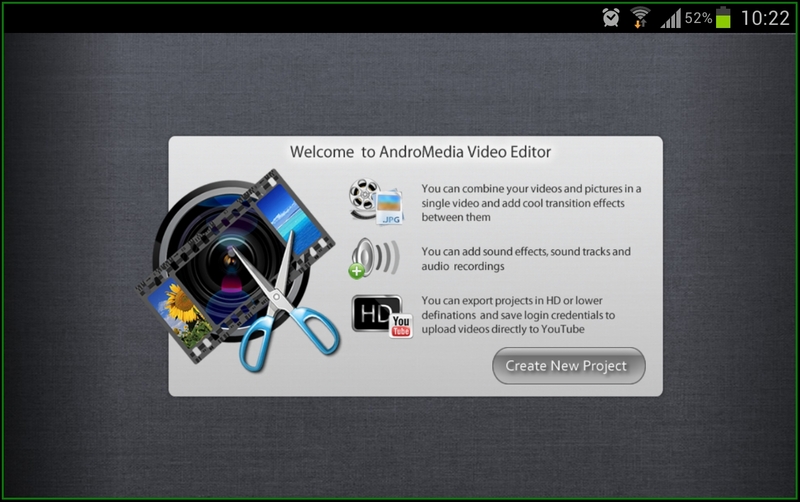 So that was quite simple and easy to understand on how you can edit videos or join videos using AndroMedia Video Editor. This application is available for free download at Google Play Store. Excellent article…you convinced me to download the app.